Product Condition: The Larra Boot - Women's is in Excellent condition. These boots were previously owned for three weeks. The following observations were made regarding these item. *They were tried on in indoors for an occasion. *There aren't any defects in them at all. *They got minor scuffed marks, dust, cleanable. *All warranties void, all items are sold as is. 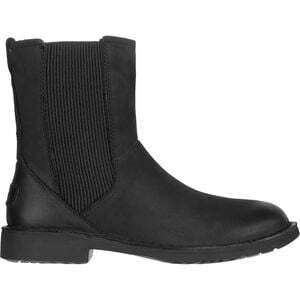 Effortless style is embodied in the Ugg Womenâ€™s Larra Boots. Two elastic gores make it easy to slip these on whenever youâ€™re in a rush to get out the door and to kick off right before you jump on the couch after getting home from work. Sleek leather hides your socks littered with holes underneath and provides a sophisticated look even under your most worn jeans. Plus, the wool lining offers up the comfort youâ€™re looking for during your everyday look.